When you are shopping for an engagement ring, you should inquire if the rings you are looking at come with an independent valuation. Valuations are important for three main reasons. The first is that they verify that the diamond in the ring is the same diamond as is described in the diamond certificate. The second is that the valuation is an independent measure of the quality of the ring. The third is that most insurance companies will require you to provide them with a copy of a valuation when you insure the ring. 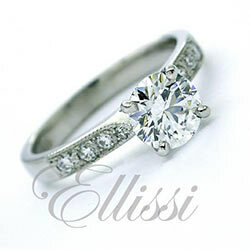 At Ellissi we supply an independent valuation with every ring we make. Our valuations are always written by a member of the National Council of Jewellery Valuers (NCJV). This is a third party opinion on the quality and standard of the ring. It also confirms the diamond and gemstone details. Often retail shops write their own valuations. The people writing these “valuations” may not be qualified. This is something that you would need to check on. If they are employed by the company selling the ring, they are not independent. Despite this being a clear case of a conflict of interest, some shops still write their own valuations. For a valuation to be worth more than the paper it is written on, it should be drawn up by a valuer who is registered by the National Council of Jewellery Valuers (NCJV). A registered valuer is a qualified person who has undertaken studies in diamond grading and valuing. Some valuers have special areas of expertise. Valuers are required to undertake ongoing studies to keep up to date with changes in the jewellery trade. If you have bought a ring overseas, it may have a valuation that was written in the country it was bought in. Even if it is accurate, this valuation is not valid for insurance purposes within Australia. This is because insurance companies here need valuations that have been written with the Australian market in mind. Part of the detail the valuer must consider is the exchange rate for the Australian dollar as against the US dollar and the impact this may have on the cost if an insurance company has to pay to replace the piece. This is because diamonds are traded around the world in US dollars. The payout for any claim will be in Australian dollars, so your premium is worked out on this basis. Aside from the issue of the valuation, we definitely do not recommend buying something as important as an engagement ring overseas. Unfortunately, on occasion we do see clients who have gone down this path, and the end result for them is not always a happy one. For more information, click on this link: beware dodgy diamonds. What does a Valuation cover? A valuation by a member of the NCJV will have a full description of the item. The metal type is identified. The weight of the ring and the gemstones are noted. The diamond’s weight, colour and clarity may be estimated if certificates or other “known weights” are not supplied with the ring. Any certification provided with a diamond is checked and noted on the valuation. If the diamond has a laser inscription the valuer compares it to the number on the certificate. The valuer checks the diamond to make sure it is the same diamond as described in the certificate. The valuer also assesses the general level of quality of the item. They take into account the method of production of the ring. 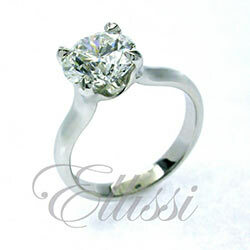 A hand made ring will have a higher value than a ring that has been cast. Once this detail is gathered, the valuer can then work out the full retail insurance replacement value for the item. This is not usually the price that you pay for the ring. The value is worked out on the full retail cost before any negotiations over price have taken place. Although not the price you should pay, the valuation does give you a good idea of what the full “recommended” price is. National Council of Jewellery Valuers. Registered valuers have a strict code of conduct and a set of detailed rules. They need to apply these to arrive at the final assessment of any given item. They have many years of training before they can become a registered valuer. Valuers also have a great network of assessors with expertise they can draw upon. Valuers often seek out the opinion of other valuers if they would like a second opinion on a piece they are looking at. You can read more about what is required of a registered valuer on the National Council of Jewellery Valuers website. The site also provides information about where you can find a registered valuer. We provide a valuation from a registered NCJV valuer for all the diamond rings we make and most wedding rings too. This is because we prefer to have all of our work checked and verified by an independent third party. This is a service we provide as a matter of course, free of charge. You can be reassured that you receive exactly what you have paid for. We keep a record of your valuation in case you ever need to make a claim on your insurance.